Learn to play Texas Hold'em and Omaha the quick and easy way with any of these iOS poker schools. 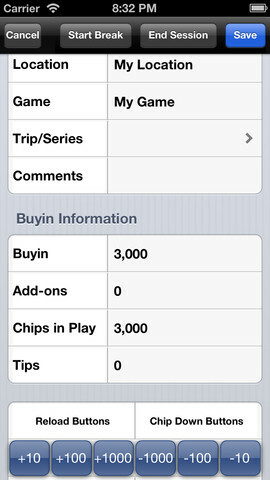 These apps will teach you all you need to know about poker strategy, card ranking, how to estimate odds, tournament play and more. Poker may be an easy game when it comes to basic rules, but players who neglect the fact that becoming successful in any specific variant requires hours upon hours of work to improve your skills are quick to see their entire bankrolls fade and vanish. If you want to avoid this fate, you’ll have to find some reliable resources first – but in the end, even the best theory books won’t provide you with the hands-on experience necessary to consolidate your knowledge. Learning at the tables on the other hand can become a rather costly process, especially since free play practice games don’t really follow the same dynamics you’re going to experience at a real money table. Fortunately, that doesn’t mean that novice players are caught between a rock and a hard place, as there’s plenty of quality tutorial apps that can help you bridge the gap between theory and actual in-game application. As you’d expect, while PC and Mac users have the largest number of resources at their disposal, the massive surge of popularity of iPhones resulted in some quality apps being released for Apple’s smartphones. 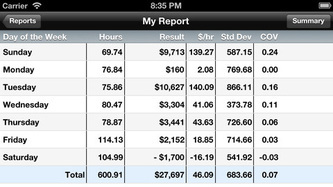 This article is meant to give you some idea of how those apps can help you improve your game and what specific pieces of software you should be looking out for on your next visit to the iTunes store. 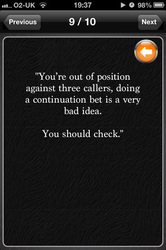 Knowing the odds every single time instead of memorizing the most obvious cases can be extremely important in any unclear situation, but only the best players are capable of calculating them on the fly. This particular app has been designed to teach you how to estimate the odds in your head instead of relying on a calculator or using an inadequate approximation and allows you to gain a deeper understanding of the entire concept. 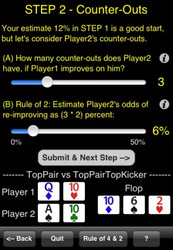 Poker Odds Teacher is a $0.99 app which instructs you in following a simple three steps procedure that takes both your outs and your opponent’s counter-outs into account and provides you with plenty of intriguing and varied pre-flop and post-flop training scenarios to practice this method on. 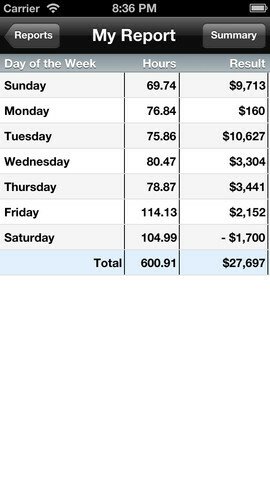 Quite obviously, becoming proficient at using this method can be rather time-consuming and challenging, but if you keep practicing I can guarantee you’re going to notice that your efficiency is improving, especially since in the end it all boils down to performing simple math operations without becoming too distracted in the process. 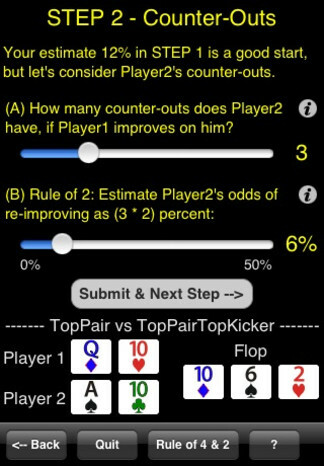 HeadsUp Poker Trainer is a neat $1.99 app designed to help you in mastering the perfect equilibrium strategy for heads-up, or one on one, poker. 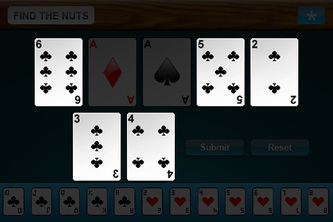 The app relies on the concept of Nash Equilibrium, which is the perfect point for pushing and calling ranges where neither you nor your adversary hold any advantage over one another. Quite obviously, this doesn’t account for your opponent’s psychological profile and tendencies, but it’s an important starting point when you’re trying to build a balanced, flexible play style. Aside from an ability to browse, push and call hands, the app allows you to take a HeadsUp Quiz with four distinct difficulty settings and to review your history and play any hand you’ve been dealing with over the past 500 quizzes. 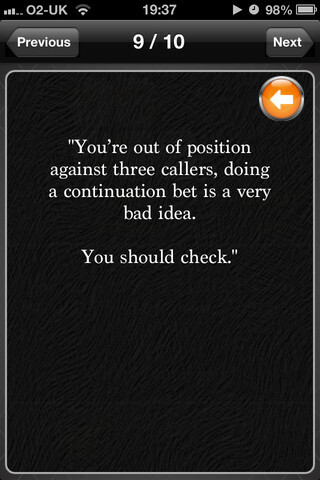 If you’re serious about learning how to play heads-up poker, you should definitely consider giving this app a try. 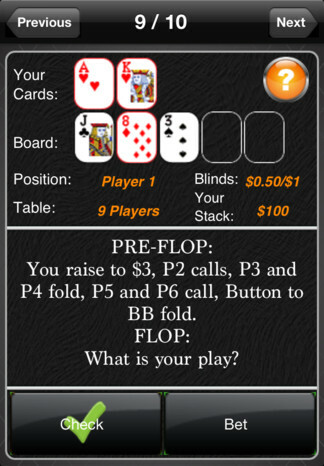 Poker USA from Poker Brain Ltd is a free app and a well-rounded tool designed to help you improve your general poker skills by facing you with concrete, realistic hands and situations, and giving you feedback when it comes to areas you need to improve on. The app is packed with thousands of quizzes that will challenge your knowledge regarding subjects such as tournaments, cash games and more. Even better, your decision -making skills will be scored accordingly and once you complete each quiz, you’ll be able to view an in-depth answer to each question you were faced with. 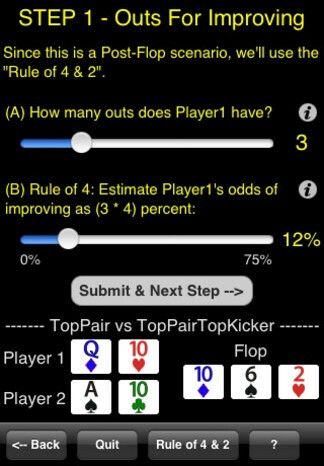 In the end, while this app isn’t particularly impressive from a technical standpoint, it’s an extremely solid tool that allows you to make sure you’ve memorized the most important poker concepts. It won’t replace a solid theory book, but it will help you consolidate your knowledge and dive into the games with an advantage over your opponents. 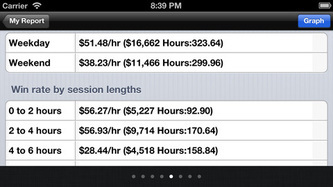 Poker Expert isn’t a traditional training app, but it will allow you to improve your bankroll management and track your progress as you’re learning the game and expanding your skillset. 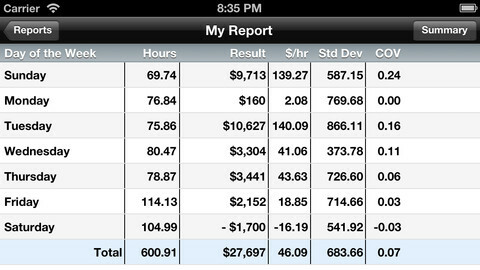 This $6.99 app lets you record your gaming sessions, classify them and use them to create reports showing your weekly, monthly and yearly results. 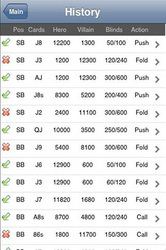 Consequently, Poker Expert is best suited for intermediate and even advanced players, who will undoubtedly appreciate the ability to import data from other specialized pieces of software like Poker Income, Poker Track Pro, Poker Journal or Statking. 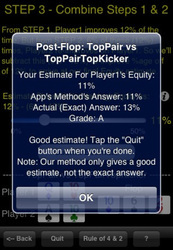 Last, but definitely not least, Poker Expert comes with a neat set of help files that will assist you not only in getting started with the app, but also in familiarizing yourself with various statistical terms and general theory. Definitely a must-have for any serious poker enthusiast. 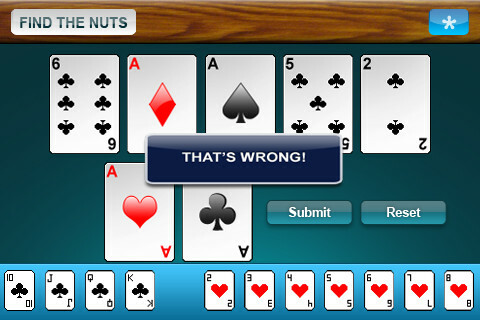 Find The Nuts is a neat $1.99 app designed to assist the beginners in learning how to properly read community cards and identify the key cards that will make the strongest combination on any given table. This particular app will help you in avoiding the mistake of focusing on your hole cards too much by letting you practice with 3, 4 or 5 community cards. 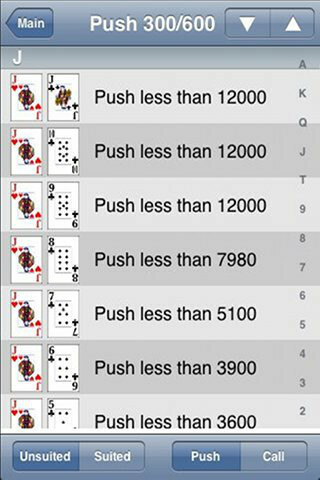 Once you become proficient with reading the table, you might want to test your skills in Progressive mode, which deals you the flop, the turn and the river and allows you to try re-evaluating the possible combinations as the hand continues to unfold. 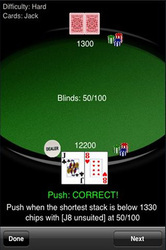 Needless to say, this app won’t help any intermediate or advanced player to improve, but if you’re a poker newbie it just might save you from losing that one important pot due to tunnel vision and lack of practice. 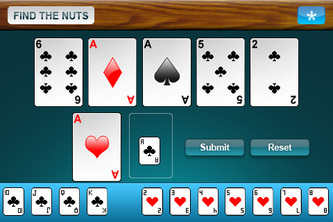 Poker Brain is designed to let people learn the game of poker at their own pace. The app is basically set out in a quiz format where you can work your way through a number of different categories including beginner, cash game, tourney, odds and general knowledge. 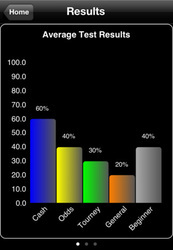 Each section contains 10 questions and with each question you will get a number of answers to choose from. What’s great about the quiz is that it allows you to see why you got a question wrong or includes information as to why your answer was correct. The number of questions you got right or wrong can be tracked and you can take any of the quizzes as many times as you wish. Additionally the app prompts you before starting the quiz to read up on the appendix section. This includes a seating plan, hand rankings, an outs percentage and ratio chart and also a section on understanding pot odds. In all honesty, this section alone will be of a massive value to most players but it’s important that its read and understood before taking the quiz. 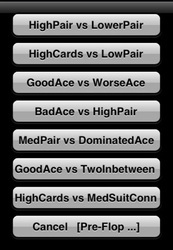 Insta Poker is an app that’s very much one of a kind. 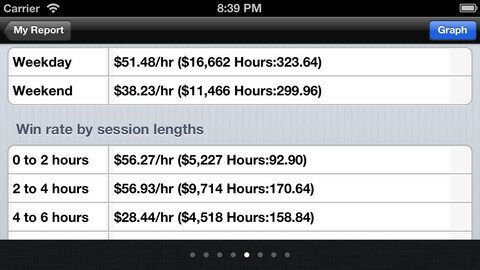 The concept behind it is that it integrates a number of books which are purchasable from their store into their app. Once you have read a certain section from your book then you can play out this scenario at the table to get a better understanding of the concept. What’s great about this is that it ranges from beginner to advanced theories meaning this app is targeted at a much wider audience than most. For each aspect of your purchased article, when at the table you will receive points on making the right decisions. The more correct decisions you make the more points you earn. 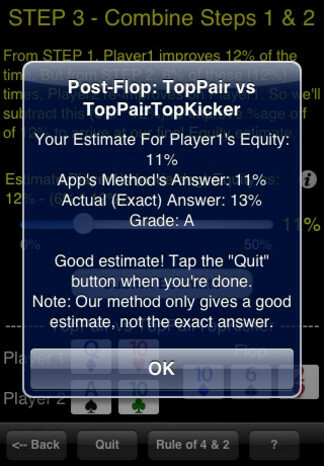 The app also explains why your move was either correct or incorrect at every stage of your decision making process. The opponents you play against will also range in ability and style, so this means you to react to this as well. 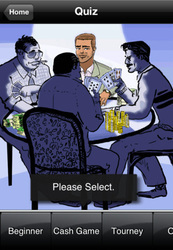 Without doubt one of the best poker tutorial apps we have come across. 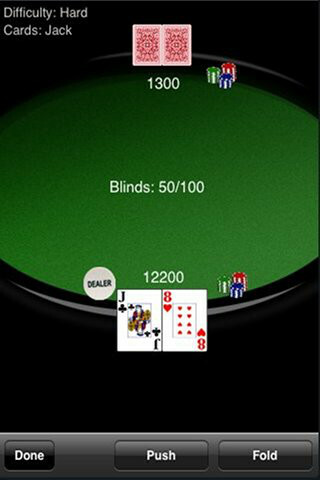 The WPT (World Poker Tour) is one of the biggest brands within the poker industry and their poker trainer has become one of the most popular in the mobile poker applications. 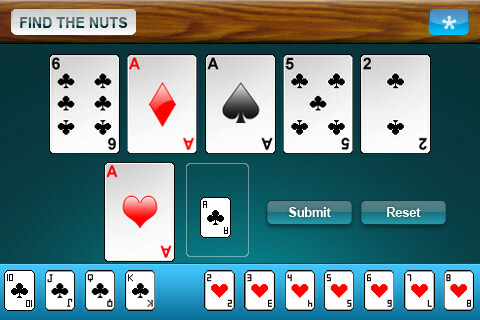 The app works by unlocking a series of poker packs ranging in aspects such as ability and play types. 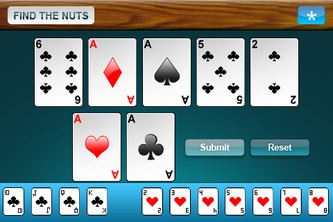 These might include, pre flop play, continuation betting, odds and practice hands. Once selected you will be able to read about each section before then being taken to the tables to play through some live examples. 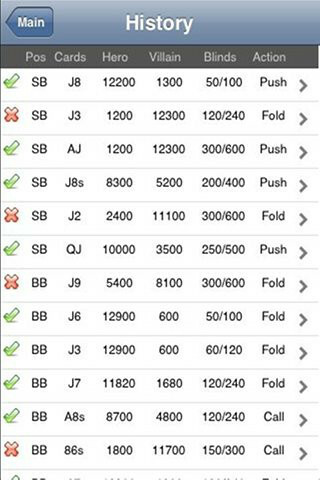 The real time playing scenarios are an aspect that make this app so good as it not only lets you read about why each move is better than another, but also see how opponents might react to your betting patterns. Additionally there is a player stats section that allows you to see how well you are doing in terms of making the right decisions. It’s a great feature to be able to see which parts of your game you need to work and will give you tips as to what to do to improve these areas of your game. One thing that was noticeable on the app is that you will need to pay for some of the packs which can get rather pricey, but after sampling a couple we can confirm that they are actually really good value for money. The Poker Trainer is one of the simplest apps that we have looked at in this review. The concept behind it is basically just a poker quiz that you need to work through and progress to complete. But, each section gets progressively harder and the multiple choice questions get a little more obscure so to complete each level you really need to concentrate. After each question in the quiz the app will fire out a bit of information regarding your answer whether it is correct or incorrect. 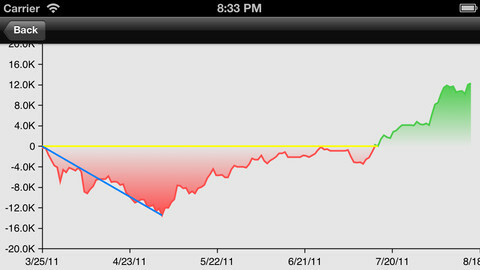 This is the strategy part and the section where you will essentially learn about that concept. The early stages are really easy but as you work through the levels they will get much tougher and allow you to really test your poker knowledge. This app is completely different to anything we have covered in this review. For one, it’s solely dedicated to SNG’s and two it’s a real time video of one of the best SNG players in the world – MR Rock Solid. Whilst this isn’t the same as your usual apps, it provides just as much information – if not more- and some massively important concepts for the variation of SNGs. The video is of Mr Rock Solid playing his way through a SNG of which he just so happens to win. He discusses concepts such as raising in position and stealing the blinds along with some basic ICM concepts for more advanced players. 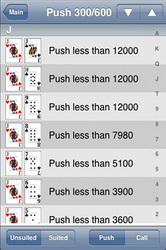 Whilst not a traditional app by any means, watching this 45 minute video will likely give you way more than the majority of apps out there for SNG players at least. As poker continues to make massive strides within the mobile world, it probably comes as little surprise to hear that many of the training aids are also being made available on the iPhone. 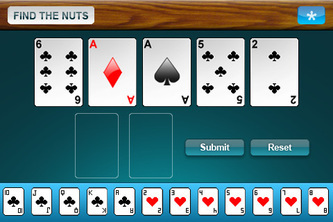 Whilst these programs are going to be smaller versions of what you can get online, the apps are designed to help players improve their poker skill set. Admittedly most of the apps we have tested have been targeted towards beginners and intermediate players at best, but we still feel that there will be one that provides something for every player type. It’s important to understand that each app will be fitting a particular brief from the manufacturer and so it’s pretty hard to compare them against each other. 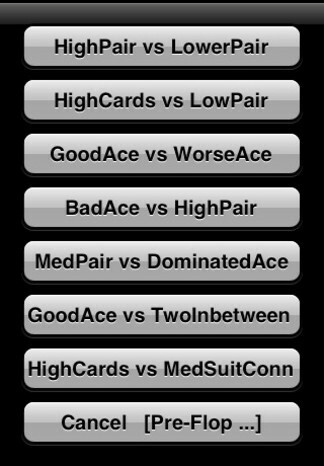 That being said, at the end of the day they are all aimed at the poker tuition market so it will be interesting to see how they stack up against each other.